No, I am not getting all philosophical on you! 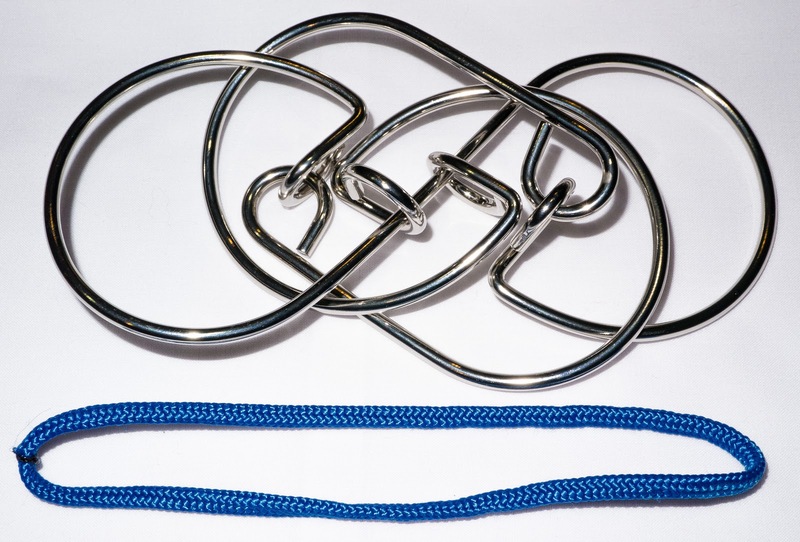 This puzzle is the Infinity because of its shape. 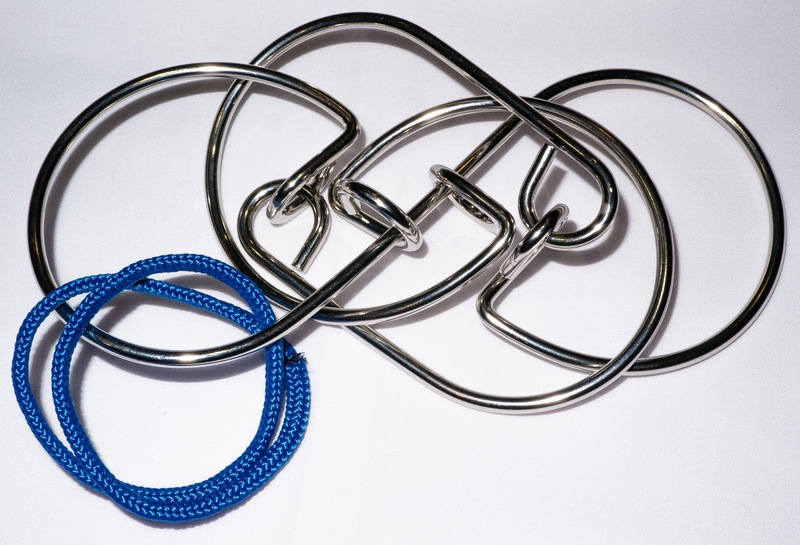 It is part of Puzzle Master's series of wire and string disentanglement puzzles. You know I can't resist them! They are pretty cheap, they're shiny, very portable and perfect for torturing friends without worrying too much about damage - well as long as the string isn't too long! In my last order from Puzzle Master I deliberately chose some of the more difficult ones and also ventured into the string series which really frighten me. Oddly, this one is a level 9 (Gruelling) in Puzzle Master's scale going from 5 to 10 and it got me wondering how such a complex contraption including string wasn't a level 10, hence it ended up in my delivery and on my "puzzles to do" shelf. I have been spending like there's no tomorrow (much to the disgust of the present Mrs S!) and my puzzles to do shelf is bursting with even more toys in the mail to me as we speak!!! Don't tell her please? Pretty please! Ouch!!!! It arrives in the usual plastic clamshell package which for me at least goes straight in the bin - I don't have the space to keep any packaging and I believe all puzzles should be played with and not just kept for show. It is a pretty large puzzle at 8.4 x 9.5 cm and very nicely made. It is very good value at $12. The instructions are simply to remove the string loop which has been doubly wound though the loop of the infinity symbol. This is a level 9 puzzle and so you might well need a solution for it - It isn't supplied with it but can be downloaded from here. First fiddle with this one had me a little stymied - I could not for the life of me work out where the exit point was! There are several loops but none seemed to me to lead anywhere apart from back into the puzzle. So I ended up doing my usual and just fiddled with it whilst desperately hoping I would remember what I had done. Did I manage it? Heck no! Whilst chatting to a friend and still fiddling I suddenly realised that it was not double looped any more! Doh! So, now the choice - do I try to loop it back to the beginning in the hope that I would then remember what I had done or do I carry on and try to do the unlooping again? I opted for the latter because I really hadn't a clue and I sort of hoped that it would be the same movement again. I fiddled and fiddled and played and played - getting me nowhere further! At least the knots were pretty easy to undo. In the end I had to give up for a day or so with it half solved! I left it on the desk for a while and it taunted my puzzle manhood - eventually I couldn't stand it any longer and picked it up again. Back to fiddling! Sigh! Within about 10 minutes the string was removed!!! It is a very clever set of moves that are nowhere near as hard as I made them out to be. I now see why it is a level 9 and not a 10. Should you buy this one? I think it is a good one for the serious collector. I seem to have made it much more difficult than it really is and any reasonably experienced disentanglement puzzler should find this a small but pleasurable challenge. It has a very unusual solution which completely fooled me to my shame. For a newbie, this might be a bit too tough but at least it doesn't knot up. At only $12 you don't have much to lose! 6 Piece burrs don't have to be boring!